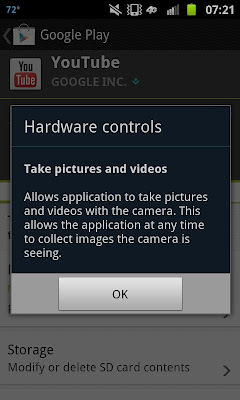 YouTube Collecting Pictures from Phones at Anytime WITHOUT PERMISSION - Big Brother Camera! This YouTube update will allow ANYTHING you take with your camera to be COLLECTED at anytime by YouTube! If you accept the update you GIVE YouTube "Big Brother" unlimited access! ALWAYS read what you are accepting! ACTUALLY, as worded, "...what the camera is seeing" combined with another NEW permission that starts YouTube when you start your phone (running in background) gives YouTube the ABILITY, AND PERMISSION, to "collect" pictures at "ANY TIME" WITHOUT SWITCHING to the camera function! We may NEVER know when they are "COLLECTING"! Spread the word! ANY LAWYERS OUT THERE WHO CAN COMMENT ON LEGAL WORDING?